As early as 2828 BC, soya was described by the Chinese Emperor Shen Nung. The soyabean was grown between the 17th and 11th century BC in the eastern, half of China. Soya was then regarded as one of the 5 holy crops, alongside rice, wheat, barley and millet. Soya is made from the soyabean plant Glycine max. In 100 to 150 days the plant forms hairy legumes containing the soyabeans. Soyabeans ripen in the pod into a hard dry bean. Although most soyabeans are yellow, there are also some less common varieties with a black, brown or green color. There are about 1000 soyabean varieties with different properties. Soya is very versatile. Soya can be used as whole soybeans, or processed as soya milk, tahoe (tofu) or soya sauce. Soya can be converted to edible fungi tempeh. Soya products such as tahoe, tempeh and soya milk are very rich in proteins. This protein is of excellent quality because it contains all essential amino acids. The amino acids of soya combine very well with the amino acids of cereals. Soya is, therefore, a very important food for vegans. The whole soyabeans are an excellent source of proteins (40%) and dietary fiber. The soyabean surpasses all other foods, even fish and meat, in terms of proteins. 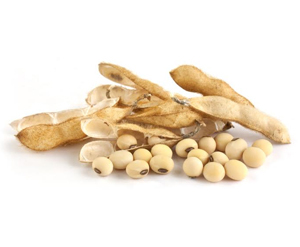 In addition to the high protein content, the proteins of the soyabean are also of very good quality. The soyabean contains all 8 essential amino acids in a very favorable ratio. Research has shown that consuming soya products can have many benefits for women in the transition. The American FDA allows health claims on food packaging, especially that soya protein can reduce the risk of heart attacks. Natural soya products do not contain much calcium, but the consumption of soya can help to prevent osteoporosis (bone decalcification). 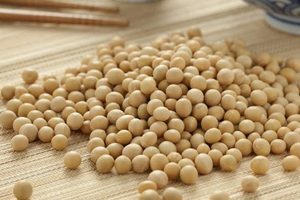 Several studies have shown that soya isoflavones (substances that resemble estrogens) have a potentially positive effect on the maintenance of bone density. Several studies indicate that a regular intake of soya can help to prevent hormone-dependent cancers such as breast cancer, prostate cancer and uterine cancer.